I am a kale convert. It has numerous nutritional benefits, including vitamins A, C, and K; 20% of your recommended daily fiber per serving; omega-3s; anti-oxidants; and cancer-preventing glucosinates. It also helps to detoxify your body and contributes to cardiovascular health. Plus, it’s incredibly cheap to buy fresh. What’s not to love? Apparently, kale is a trendy food, which is probably why I read about it in the first place. But that shouldn’t stop you from savoring its delicious flavor. If you haven’t tried it yet, pick some up at the grocery store, farmer’s market, or even better—grow your own! I’ve convinced friends to try the superfood, but I always hear the same thing from them: what do I do with it? Well, first, prepare it. Using kitchen scissors, snip the leaves from the stalks. Chop the stalks and leaves in separate piles into the size desired. I prefer bite-sized chunks for most recipes, but you will want larger portions if you are making kale chips (see below). Rinse the leaves in a colander and pat to almost-dry. A little bit of moisture left on the leaves will help it steam. 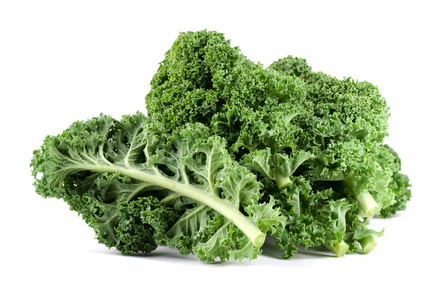 If you will be storing kale for future use, don’t rinse until just before you use it. My husband got me this awesome tee from EatMoreKale.com for Christmas! The stalks are a little tougher and take longer to get tender than the leaves, so depending on the recipe you are preparing, you may want to keep the stalks and leaves separate. Stalks can be used in soups and stews, providing a little texture and crunch. Add it to sauces, soups, stews, and chilis. It provides a nice pop of color and fortifies the meal with its vitamins. It pairs wonderfully with sausage and white beans. Make chips. Before I made my own batch of chips, I had heard two different things from friends: they loved it or they hated it. My husband loved it, my kids hated it, but I find I’m in-between. I tossed a bunch of chopped kale with about 2 TBS of EVOO and a sprinkling of sea salt. (I know, very precise measurement, eh? What can I say, I season to taste!) Bake in a 300º oven for about 15 minutes or until the kale is crackling-crisp. Baked Kale Chips plus advice for kale-dusted popcorn! Do you have a favorite kale recipe to share? I’m always looking for something new to try! Share it in the comments below. If you haven’t tried kale before, I would love to hear from you once you do. Come back and talk to us! « J is for Just Do It! I love Kale and have found it so versatile! I love it in Pasta and sauted with garlic and sausage. I’ve had it in salads, sauted with potatoes – what a fantastic vegetable! Salad is one thing I haven’t tried kale in! What kind of greens do you mix it with? I love kale! I put it in the blender with pineapples, mango juice, and whatever other fruits might be around. It makes a great breakfast drink!